Pir Ibrahim Farajajé and Netanel Miles-Yépez at the memorial event celebrating Rabbi Zalman Schachter-Shalomi's life and legacy at Naropa University, March 1, 2015. Photo by Issa Farajajé. On February 9th, my sweet friend, Pir Dr. Ibrahim Abdurrahman Farajajé, was received into the loving arms of the true Friend. For much of our own friendship, we were mostly 'pen-pals.' But those who still write to each other know how significant a relationship that can be. Ibrahim Baba, as I and many others called him, first wrote to me in the Fall of 2010. In the years that followed, we checked in with one another from time-to-time, exchanging holiday greetings, articles we had written, and discussed Qur'anic passages. We talked over numerous book projects, and even had ideas of working on something together. He had begun a book on the Four Worlds as described in Sufism and Kabbalah, and we talked about working together on a book of parallel stories from Hasidism and Sufism. It makes me sad now to think that this will never happen. He was a remarkable man of wide interests and exceptional abilities, with a still more exceptional heart. A Muslim Sufi pir of the Chishti Order, holder of the keys to the dargah of Khwaja Mu'in ad-Din Chishti in Ajmer, he was also a spiritual activist with a broad experience of many religious traditions and knowledge of nearly seventeen languages (he was learning another for fun when I last spoke to him). He was formerly Provost and Professor of Cultural Studies and Islamic Studies at the Starr King School for the Ministry and faculty at the Graduate Theological Union in Berkeley, California, living part of the year in Turkey. He was also a friend and close colleague of my own beloved teacher, Rabbi Zalman Schachter-Shalomi, in the last years of his life. Ibrahim Baba next to a portrait of Reb Zalman in Rabbi Zalman Schachter-Shalomi's library. — Netanel Miles-Yépez, 2015. Netanelji, i just want to send galaxy-oceans of my love to you at this delicate moment. I am holding you in the Cave of the Heart in my du'a and dhikr. I can only imagine how this must be for you. Please know that I am surrounding you with angelic hosts . . . Love UPON LOVE, Ibrahim Baba. I cannot even begin to imagine how difficult and sad a moment this must be for you. I will not clog up your time or space, but I wanted you to know that I am holding you in my heart at this moment and in the days to come. I am grateful for all that you did for our beloved Rebbe/Shaykh over these many years. I bring you the condolences of our particular Chishti lineage on the loss of your shaykh and pray to support you in the responsibilities that now are with you as his successor. May you be comforted by the One who Comforts all who mourn and who experience tears in the fabric of their existence. Love UPON LOVE, Ibrahim Baba. He had such a beautiful 'manner,' or adab, as we say in Sufism. His was not the elegant formality of some Sufis, but a genuine, sometimes raucous outpouring of unrestrained love that I appreciated still more. And yet, on another occasion in which I was dealing with a still deeper grief and pain, I remember fondly how he said nothing at all, but simply looked at me tenderly, reached out and held my hand for a long time. I believe I fell in love with him then. In the Spring of last year, I had the joy of being able to invite both Ibrahim Baba and his beloved and wonderful son, Issa, to come and participate in a special memorial program for Reb Zalman at Naropa University, where I teach. At that time, he dialogued with Rabbi Arthur Green, Tessa Bielecki, and Acharya Judith Simmer-Brown on Reb Zalman's legacy and their own relationships with him. He was a hit with everyone, and the President of Naropa, Chuck Lief, approached me immediately afterward, telling me how much he had enjoyed Ibrahim Baba, suggesting that we needed to find a way to bring him back to Naropa as soon as possible. 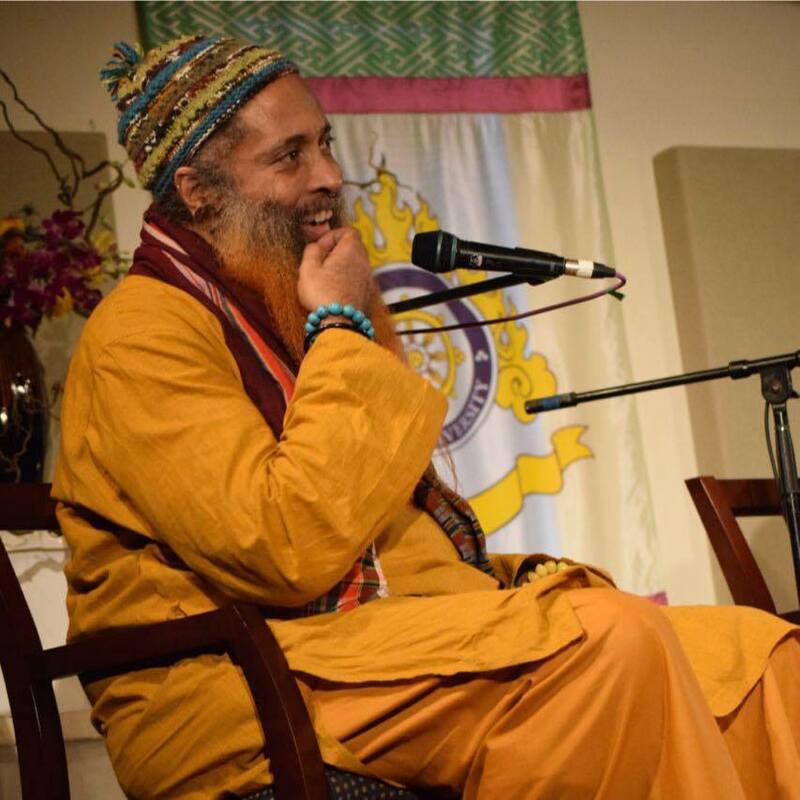 Ibrahim Baba during the interfaith dialogue at Naropa University in honor of Rabbi Zalman Schachter-Shalomi, March 1st, 2015. Later that night, we met for dinner at the Boulder Dushanbe Teahouse, and afterward went to Reb Zalman's house, where we visited with his widow, Eve, late into the night, eating dessert, and trading stories while sitting at the dinning room table and down in Reb Zalman's library. The next day, he went out to find Reb Zalman's grave in the cemetery, at that time covered in snow, and without a marker. I did my best to try to guide him there over the phone. He found the general area and offered dhikr and d'ua for the peace of Reb Zalman's soul. Ibrahim Baba and I in Rabbi Zalman Schachter-Shalomi's prayer room, looking at the very first "Rainbow Tallit." Photo by Issa Farajajé, 2015. Unaware of how sick he was, and very busy, I missed the opportunity to see him while I was in San Francisco this last December. When I realized it, and his disappointment, I regretted it deeply . . . and more so now. I was in intensive care in Turkey with double pneumonia, given two weeks to live. It had presented as rapid-onset, as well. In the long hours in the hospital, on respirators, etc, I kept thinking, "But this is not at all how I had imagined learning about dying before you die!" I was expecting Mevlana's poetry, Ney playing, etc.. This was like sliding down metallic ravines. One night, I had an intense death-experience, and the Archangel Israfil told me that I had been brought to the hospital, to the ICU, to the floor where everyone died, to learn about dying before you die, and to do my work of accompanying those who move between the worlds. That is what he did here—he moved between worlds, making connections for people, helping them through transitions. I suspect it is what he will continue to do on the other side of this life. A last photo with Ibrahim Baba, Issa, Katherin, and Eve Ilsen at her home after the Reb Zalman memorial at Naropa University.